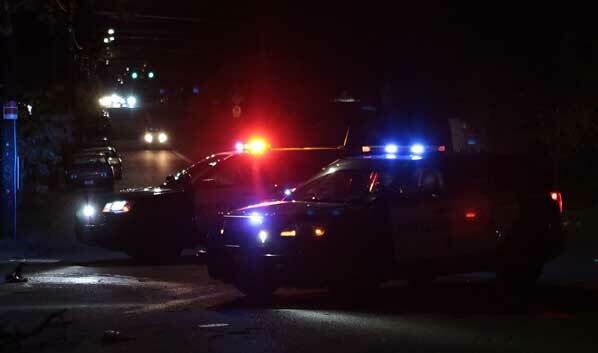 Police close off SE 92 Avenue in the Lents neighborhood, just up the hill from Powell Boulevard, after a “recklessly driven” car smashes into parked vehicles – after which, the driver runs off, leaving his injured fiancé behind. A Saturday night’s revels for three people ended abruptly just after midnight on Sunday, January 20. 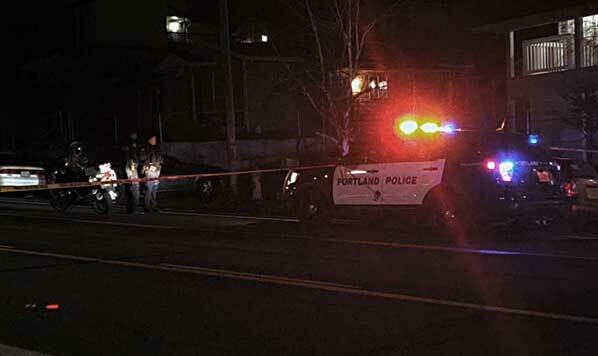 Several people called the 9-1-1 Center, reporting a crash on SE 92nd Avenue, between Powell Boulevard and Bush Street. 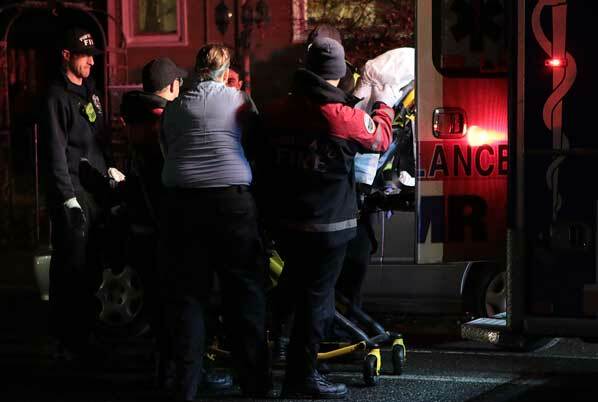 Emergency first-responders were dispatched to the smashup at 12:04 a.m., including advanced life support paramedics riding Portland Fire & Rescue Lents Station 11’s Engine. Portland Police Bureau (PPB) East Precinct officers, followed by the Bureau’s Traffic Division officers, arrived and found several crunched parked vehicles, and a nearly-destroyed car. A seriously-injured passenger is loaded into an ambulance before being rushed to a hospital trauma unit. “Preliminary information indicates that the driver was traveling southbound on 92nd Avenue at a high rate of speed when he lost control and crashed into several parked cars before coming to a stop,” recounted PPB Public Information Officer Sgt. Brad Yakots. Officers and paramedics were surprised to find that the driver of the car had run off, leaving two passengers behind: One of them his fiancé, who now might be rethinking the relationship; and seriously-injured 34-year-old Cherie Marie Swanson – who was taken by ambulance to a hospital. PPB Traffic Division investigators begin to document the results of this smashup. “Swanson, [who originally was thought to have life-threatening injuries] is now listed in ‘serious but non-life threatening condition’ at the hospital,” Yakots said the following day, and added that at that point they were still looking for the driver, identified as Nicholas Woods. Although it was unclear if Woods turned himself in or was captured, Yakots reported that Woods was arrested two days after the crash. Facing a felony assault charge, among other crimes, is 29-year-old Nicholas Michael Woods. 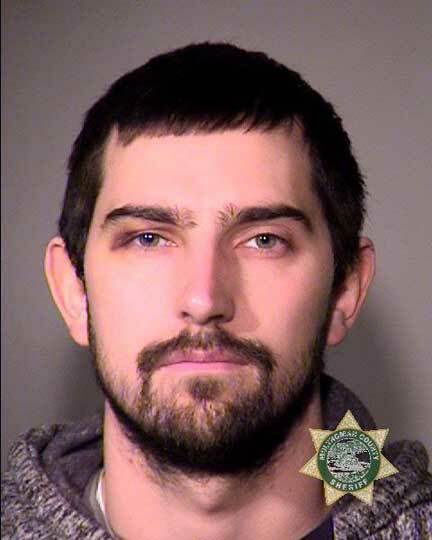 On January 22 at 2:28 p.m., 29-year-old Nicholas Michael Woods was booked into the Multnomah County Detention Center (MCDC) on numerous charges including Reckless Driving, and “Failing to Perform the Duties of a Driver-Serious Injury”. At his arraignment the following day, Woods learned he he’d been accused of six Misdemeanor charges, including one of Reckless Endangerment; and also that he’d also face an additional Class B Felony charge: Assault in the Second Degree. Woods is currently lodged in Inverness Jail in lieu of $250,000.